Maria Lupe supervises a team at Mount Sinai Hospital that assesses mental health crises involving children. Lupe’s team works on the West Side, and Lupe says that the team now sees more cases of severe crises involving younger children. Driven largely by an increase in calls from schools, the number of calls to the state’s mental health crisis hotline for children has soared by 37 percent over the past five years to nearly 42,000 calls in 2011—about 115 calls per day. A hotline call is often a sure-fire way—perhaps the only way, in some cases—for clinicians, teachers and other school personnel to get help for a troubled child. A call triggers an assessment of the child via telephone and then, if the child shows severe symptoms, an immediate assessment by a community mental health agency. More than two-thirds of children who spent any time in a psychiatric hospital in 2011 came through this assessment process. Once a child is referred for an assessment, he or she automatically receives therapy for 90 days from the mental health agency, regardless of whether they are hospitalized. Social workers and others consider this process the quickest way to get help for a child. Last year, at least 10,000 children were admitted to a psychiatric hospital on the same day they were evaluated as a result of a hotline call. About 20 percent of the children were admitted more than once—a sign, experts say, of the lack of follow-up services for children once they are released. The deluge of hotline calls and the increase in hospitalizations—up from 7,000 five years ago—is at least partly due to cuts in funding for community mental health services, experts also note. Children who are exposed to trauma often become depressed or feel helpless, Lueck says; in turn, they may act out and become disruptive in schools. CPS has trained school staff to call the hotline “if a student is in crisis — no matter the nature of the crisis – [so] that the student can be properly screened and assessed,” says spokesman Frank Shuftan. Many community-based centers that could provide help for children have closed down, and those that are still open often have long waiting lists. Illinois ranks third in the nation for cuts to mental health services, according to a November 2011 report by the National Association of Mental Illness. Funding for community mental health services for children was reduced by 13 percent between fiscal year 2009 and 2012, according to a budget analysis done by Illinois KidsCount, an annual report with data on children and families. “Children who do not get treatment in the community wind up coming through the crisis door,” Carroll says. “CPS sees everything, from aggressive children to psychotic children, and they are the least-trained to deal with it. The assessment system has long been used by the state’s Department of Children and Family Services, to curtail the flow of foster children into psychiatric hospitals. In 2004, it was expanded to serve any child without insurance or with public insurance, such as Medicaid or KidsCare. About half of the children in Illinois have public insurance, according to Illinois KidsCount. The expansion was born out of the Illinois Children’s Mental Health Partnership, whose executive committee wanted the hotline and assessment system to serve more children and prevent the over-use of psychiatric hospitalization, an expensive option that experts say should be used as a last resort when children are a danger to themselves or others. In one case, a student told the social worker that she had tried to commit suicide by taking dozens of pills, leaving the empty bottles on her nightstand. She woke up later, but her mother wouldn’t acknowledge the suicide attempt. In another case, a child told her that he talks to ghosts. Yet another student was so aggressive, angry, and out-of-control that the social worker feared another Columbine-style shooting. The young man was admitted to the hospital; he has since been released and is back at school. She tries to keep a close eye on him, yet notes that she’s the only social worker in the school of nearly 1,500 students. When she questions whether or not to call the hotline, she first calls Community Counseling Center of Chicago. Sometimes she is advised to call the hotline. But in other instances, the agency tells her to see if she can talk the parent into getting the child help in the community—and often the parent doesn’t take that action. “I had one student who was muttering and wouldn’t make eye contact and was acting really bizarre, but the family didn’t want services,” the social worker recalls. She tries to keep an eye on him, too. Troubled children, in fact, are often caught between a mental health system that is stretched thin and a parent who has trouble making time to deal with the problem, says Ashley Fountaine, a project manager with the Chicago chapter of the National Association of Mental Illness. Hospitalization is not always a bad option, Fountaine adds, because it serves a purpose in extreme cases. Sometimes the assessment teams get pressure from schools to hospitalize a child, according to team directors. Carroll says there have been cases in which exasperated school staff will threaten a child with hospitalization—then become angry when the crisis team refuses. Maria Lupe, who runs the assessment unit at Mt. Sinai Hospital on the West Side, says her team gets more calls about severe problems in young children, such as one call about a 1st-grader whose behavior was out of control. But Lupe also get calls from schools about situations that she considers less than urgent. One clue is if the school has sent a child home. “Why would you send them home if they were in danger?” she says. Community mental health agencies and school personnel say that even more children could be kept out of hospitals if the resources in schools and neighborhoods were better. At schools, social workers are assigned by the district based on the needs of special education students. Overall, CPS has about 360 social workers and a student enrollment of about 350,000—a ratio of about 1 social worker for every 1,000 students, far above the ratio recommended by the National Association of Social Workers of one school social worker for every 250 students. With such workloads, a crisis is often the first and only time the social worker will encounter a child who is not in special education. As a result, says social worker Susan Hickey, social workers have little time either for students who are not in special education or for prevention work. When Hickey gets wind of a student struggling with emotional issues, she refers the family to a community health clinic. But often, the parent doesn’t follow up. Assessment teams used to go into schools to do presentations on mental health and provide information about services. But the state no longer provides money for such outreach, says Michelle Churchey-Mims, director of children’s mental health and child welfare services for Metropolitan Family Services. With grant money, Metropolitan Family Services sometimes provides therapy services in schools, and the number of mental health crises in these schools seems to be lower, Churchey-Mims says. Jennifer Schultz, secretary for the Illinois School Psychologist Association, has first-hand experience with the disparity in resources. She left Indian Springs School District in the working-class suburb of Justice for a job at Homewood-Flossmoor High School in a more affluent south suburb. Now she works with three other psychologists and four social workers—in all, 11 clinicians for 2,800 students, with some dedicated solely to general education students and others focused on those in special education. In this environment, Schultz says she has ample time to provide therapy for individual students and intervention before problems become severe. Hotline calls may provide immediate help for children facing a crisis. But the larger, systemic problems with the mental health system do not disappear, and often come back to haunt them. Assessment teams sometimes cannot find a hospital bed for a child, or can only find a bed far away from the child’s home. Some communities have few hospitals with a psychiatric unit that will take children. Roseland Hospital recently opened a psychiatric unit for teenagers and Ingalls Hospital in Harvey has an inpatient psychiatric unit for children, says Churchey-Mims. If these units are full, a child from the South Side or suburbs will have to go to the West Side or the Northwest suburbs, a hardship on families. At Mt. 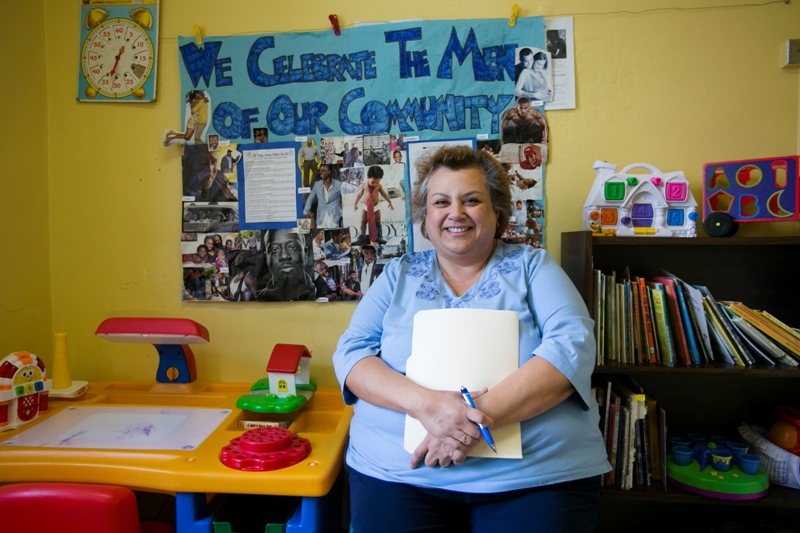 Sinai, Maria Lupe works closely with psychiatric hospitals to figure out what is the best match with the child. One of the criteria she considers is whether they have Spanish-speaking staff, since most of her clients are Latino. Another issue is a dearth of child psychiatrists in many communities, which makes it difficult to schedule follow-up appointments. An appointment is particularly important if a child has been placed on medication. “We have work to do once they are released,” Lupe says. The state requires that children released from hospitals see a psychiatrist within 14 days. To meet this requirement, Carroll set up clinic hours with Counseling Center’s two psychiatrists. Several families get an appointment for a given time, and they are seen on a first come, first serve basis. Carroll admits it’s not an ideal setup, but says it is the only way he can meet the requirement. Further, after the crisis team’s 90-day monitoring of the child, there’s no guarantee of follow-up.